Crude prices have plunged over the last five weeks, buffeted by October's broader market slump, signs of deteriorating demand and rising output from key producers. The decline continued earlier this week after the Trump administration announced it would issue waivers to eight countries, allowing them to continue importing Iranian crude for the next 180 days. The United States restored sanctions on Iran's energy, banking and shipping industries on Monday. "As a result, oil supplies are going to be higher than the market anticipated," said Andrew Lipow, president of Lipow Oil Associates. "So it seems to me that the loss of Iranian supplies is only going to be between 1 and 1.2 million barrels per day, and the OPEC and non-OPEC producers have more than made up for that." 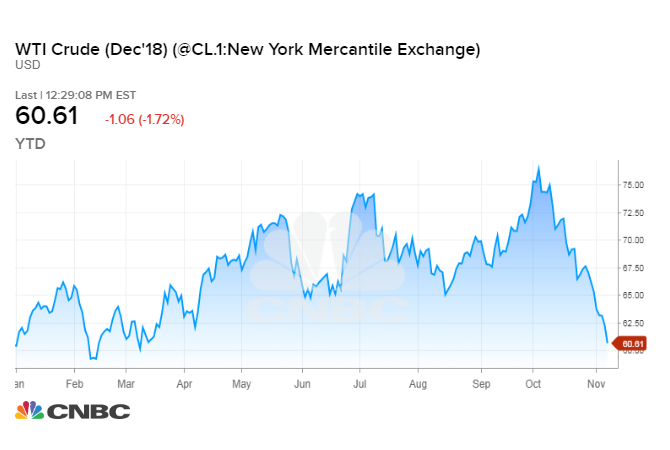 U.S. West Texas Intermediate crude fell as low as $60.40 a barrel on Thursday, briefly wiping out its gains for the year. The contract settled $1, or 1.6 percent, lower at $60.67. That's down 21 percent from last month's four-year high of $76.90, putting WTI in bear market territory. U.S. output also hit an all-time high at 11.6 million barrels per day last week, according to preliminary figures released by the EIA. If confirmed during revisions, it would more firmly establish the United States as the world's top oil producer.